Scarborough is a coastal town in North Yorkshire in northern England. Following the discovery of acidic water in the nearby cliffs in the seventeenth century, it developed as a spa, and it remains a seaside resort. The town suffered bombing from German warships during the First World War. For 500 years, the town held a trading festival, which has been commemorated in the well-known song, Scarborough Fair. Anne died of pulmonary tuberculosis in May 1849. In her last months of life, she visited Scarborough with her sister Charlotte and friend Ellen Nussey. 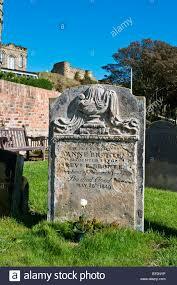 Anne was buried in St. Mary's churchyard, Scarborough.